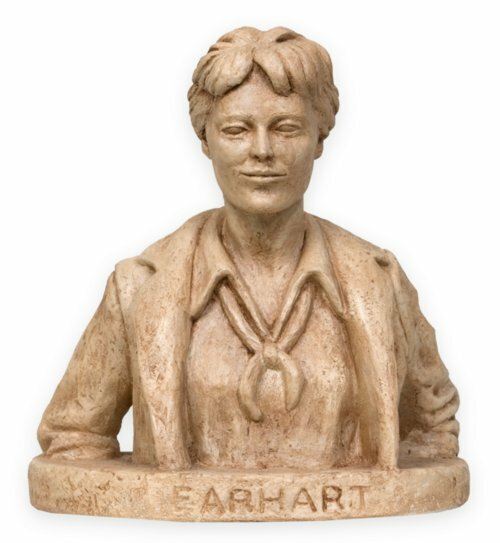 Small plaster bust of aviatrix Amelia Earhart by Kansas artist Peter "Fritz" Felten, Jr. The model is associated with the 1981 installation of statues in the Kansas statehouse rotunda. A special committee selected Felten from Hays, Kansas, as the sculptor of statues depicting four notable Kansans--Arthur Capper, Earhart, Dwight Eisenhower, and William Allen White. Felten created this small model and three others to demonstrate his design concept. Originally from Atchison, Kansas, Amelia Earhart was a noted American aviation pioneer, author, and celebrity who vanished in a 1937 flight around the world. Creator: Felten, Peter F., Jr.